The Moscow architecture firm, CPU Pride, presents the design process that led to a new sports facility, which won “BIM 2016”, the Russian national BIM technology competition. The Pride company was founded in 2013. Its founders are professionals with vast experience in implementing large and technologically complex buildings. Today, the company employs more than 60 highly-qualified specialists, including 30 architects. Pride company not only provides architectural design, but also master plan development, structural and engineering solutions. The company handles a full line-up of services: from creating concepts to leveraging urban potential; creation of design development and construction documentation of buildings and supervision of the construction phase. One of the recent projects developed by the Pride company is the Center for Rhythmic Gymnastics (CRG). The CRG, which is already under construction in the Luzhniki Olympic Complex of Moscow, has a 4,000-seat capacity and will soon be ready to host competitions and training events. Its features include partially transformable tribunes and VIP boxes. Its appearance conveys a unique roof shape resembling the wave of a gymnastic ribbon. The CRG will be completed in 2018. The CRG project won the “BIM 2016” Russian competition in the “BIM project: sports facilities” category, and it demonstrates the successful use of the OPEN BIM approach in its design. The exchange of data between software platforms was carried out using the open IFC format developed by buildingSMART (International Alliance for Interoperability, IAI). The architectural part of the project was carried out by the Pride Company. The main tools for the Design Development and Construction Documentation phases were ARCHICAD and Rhinoceros/Grasshopper. The final demo model was done in ARCHICAD, with nested Xref files, structural elements, etc. The complex design of the roof was created in Rhinoceros/Grasshopper. Its structural and engineering solutions were developed by the Metropolis company using a software for engineers. After approval of the concept, the architectural model was transferred to the relevant consultants using the IFC format. For each contractor, the file was prepared separately in ARCHICAD: some subcontractors didn’t need a roof, while others didn’t need concrete structures. To locate errors, we used the Solibri Model Checker application that performs collision detection analysis of information models. At the same time, we made a parametric model of the roof using Rhinoceros and Grasshopper-ARCHICAD Live Connection, which determined the options for the optimization of the metal frame elements. With this information, the manufacturer of the standing seam roof presented examples of the roof panel arrangements that were possible, based on the load-bearing capabilities of the metal sheets. The calculated parameters helped to determine the optimal shape of the roof. In the next stage (DD), the architects continued to work with Metropolis, which specializes in the development of structural and engineering solutions and uses a different software. A reinforced concrete structural model was created in Allplan, and then through SAPPHIRE, the file was transferred to a local analytic program, LIRA-SAPR. The metal structural model was developed in Tekla Structures and was sent through an analysis application as well. “BIM helps prevent human error. The first HVAC model we got from the engineers in the DD phase contained 1,800 collisions. And this, by the way, is not that many. Using 2D drawings, it would be simply impossible to detect all of these conflicts,” said Vitaliy Krestianchik, chief architect of the Pride company. “The architectural part of the project was done in ARCHICAD using Teamwork, a feature that allows each architect involved to see the entire project, track all the changes and avoid errors. No matter what city or country an employee is in, it’s not a problem for Teamwork.” says Vitaliy Krestianchik, chief architect of the Pride company. The CRG project is now in the construction development phase and is kept in a single BIM model. 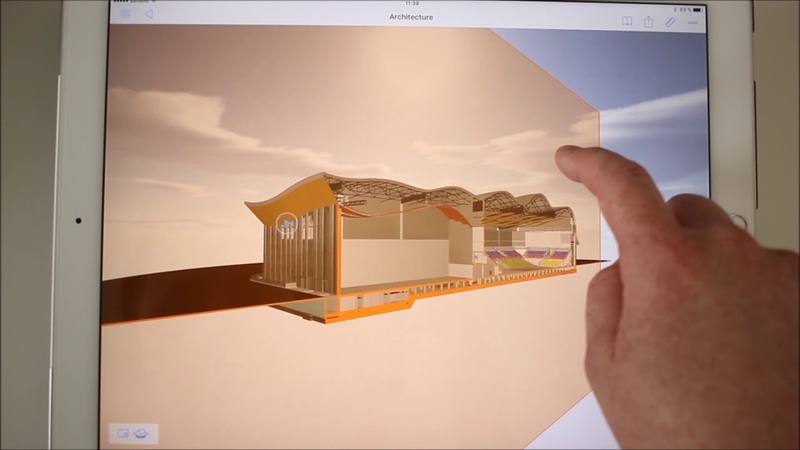 The OPEN BIM approach has proven its versatility. The OPEN BIM-based IFC file format is a universal language that enables the interaction of all project participants, regardless of the software they use and ensures the quality of data transmission. The design company followed the Russian and international standards of BIM implementation. “Thanks to the OPEN BIM workflow, participants can use a variety of software and consistently operate professionally. Using the IFC BIM data exchange, professionals were elevated to a higher level. All of this prevented many mistakes, and the quality of the documentation was much greater. BIM made it possible to build the design exactly as it was envisioned and documented by the architects.” says Nikolai Gordyushin, chief architect and partner CPU Pride. CPU Pride, founded in 2013, is a young, promising and fast-growing office that provides a full range of services from concept planning and assessment of urban potential, to the development of design and construction documentation all the way through to building permitting. The team of 60 employees have already worked on such significant projects as the Luzhniki Olympic complex, the Center for Rhythmic Gymnastics, and the Seliger City residential complex. The company actively participates in competitions and has cooperated with large international architectural firms, adapting their work to the Russian market and state regulations, advising on all stages of implementation. The Pride company ensures quality and timely design of projects of any complexity, using modern technologies, and strict control of the project’s construction process.